Nothing is quicker and more satisfying than roast potatoes, and almost everyone loves them. Wash and drain potatoes, allow to dry or pat dry. You can leave the peels on but cut away any eyes or blemishes. Cut into uniform wedges or other shape, toss with HERBS, olive oil, salt and pepper. Roast on a baking sheet at 350° for about 20 minutes, then flip the pieces and roast 15 minutes more until golden and just crunchy. Serve hot with almost anything. Yumm. This also works with sweet potatoes. In a heavy 4-qt. pot, begin sweating onion, covered, in butter and olive oil. When onions are golden brown, add mushrooms, wild or domestic, and sweat together, covered, until limp. Peel and dice potatoes. Add to the pot with crushed garlic, bay leaf, sea salt, PERFECT POTATOES HERBS, chicken stock. Bring to the boil, lower heat and simmer 1/2 hour until potatoes are soft. Stir to prevent sticking. This soup will have a rich, tawny color from the browned onions, mushrooms, and HERBS; if you wish to enhance it, whisk in 1-2 Tbsp. tomato paste, or a spoonful of red chili sauce, page 113. Add a quarter cup of Sherry or Port just before serving, a dollop of sour cream in each bowl, and chopped parseley or chives. When making homemade noodles, add a teaspoon or more to each recipe, and follow directions with your pasta maker. Add a teaspoon to each cup of rice as it cooks. Add to dough for dinner rolls or muffins. Add to marinades or mix with oil for basting on grill or barbecue. 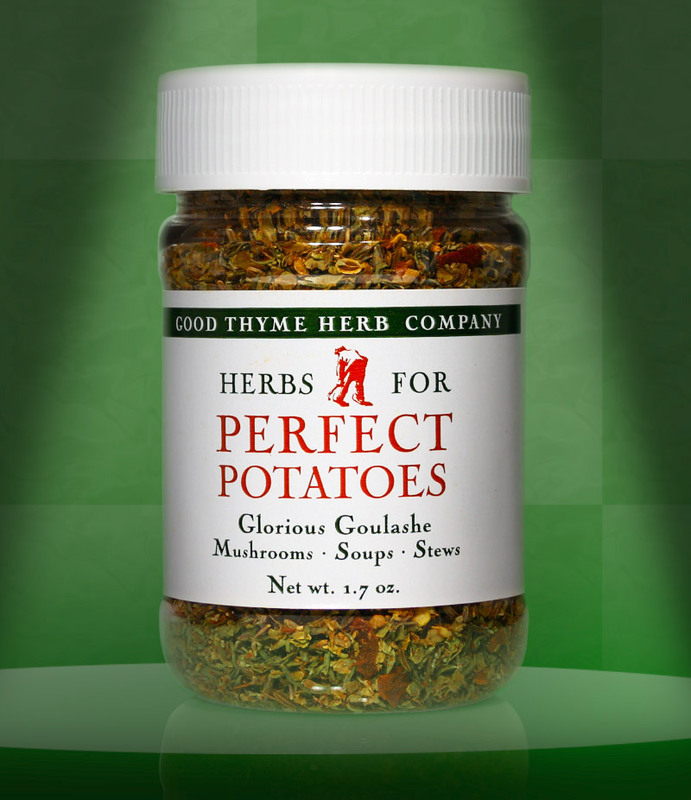 Cole slaw and potato salads have a new color and accent with PERFECT POTOTES HERBS. Simmer with potato, tomato, or onion soups for variety and taste. Hummus has a new identity with a spoonful of HERBS. Mix into cottage cheese for luncheon, buffet, or dips. Replaces BEAUTIFUL BEANS HERBS for another fine pot of beans. Toss with cucumbers in sour cream, add to Waldorf and other apple salads. Add to creamy salad dressings of all types.